So influential was John Maynard Keynes in the middle third of the twentieth century that an entire school of modern thought bears his name. Many of his ideas were revolutionary; almost all were controversial. Keynesian economics serves as a sort of yardstick that can define virtually all economists who came after him. Keynes was born in Cambridge and attended King’s College, Cambridge, where he earned his degree in mathematics in 1905. He remained there for another year to study under alfred marshall and arthur pigou, whose scholarship on the quantity theory of money led to Keynes’s Tract on Monetary Reform many years later. After leaving Cambridge, Keynes took a position with the civil service in Britain. While there, he collected the material for his first book in economics, Indian Currency and Finance, in which he described the workings of India’s monetary system. He returned to Cambridge in 1908 as a lecturer, then took a leave of absence to work for the British Treasury. He worked his way up quickly through the bureaucracy and by 1919 was the Treasury’s principal representative at the peace conference at Versailles. He resigned because he thought the Treaty of Versailles was overly burdensome for the Germans. After resigning, he returned to Cambridge to resume teaching. A prominent journalist and speaker, Keynes was one of the famous Bloomsbury Group of literary greats, which also included Virginia Woolf and Bertrand Russell. 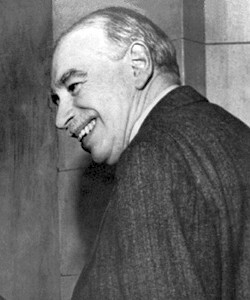 At the 1944 Bretton Woods Conference, where the International Monetary Fund was established, Keynes was one of the architects of the postwar system of fixed exchange rates (see Foreign Exchange). In 1925 he married the Russian ballet dancer Lydia Lopokova. He was made a lord in 1942. Keynes died on April 21, 1946, survived by his father, John Neville Keynes, also a renowned economist in his day. Keynes became a celebrity before becoming one of the most respected economists of the century when his eloquent book The Economic Consequences of the Peace was published in 1919. Keynes wrote it to object to the punitive reparations payments imposed on Germany by the Allied countries after World War I. The amounts demanded by the Allies were so large, he wrote, that a Germany that tried to pay them would stay perpetually poor and, therefore, politically unstable. We now know that Keynes was right. Besides its excellent economic analysis of reparations, Keynes’s book contains an insightful analysis of the Council of Four (Georges Clemenceau of France, Prime Minister David Lloyd George of Britain, President Woodrow Wilson of the United States, and Vittorio Orlando of Italy). Keynes wrote: “The Council of Four paid no attention to these issues [which included making Germany and Austro-Hungary into good neighbors], being preoccupied with others—Clemenceau to crush the economic life of his enemy, Lloyd George to do a deal and bring home something which would pass muster for a week, the President to do nothing that was not just and right” (chap. 6, para. 2). In the 1920s Keynes was a believer in the quantity theory of money (today called monetarism). His writings on the topic were essentially built on the principles he had learned from his mentors, Marshall and Pigou. In 1923 he wrote Tract on Monetary Reform, and later he published Treatise on Money, both on monetary policy. His major policy view was that the way to stabilize the economy is to stabilize the price level, and that to do that the government’s central bank must lower interest rates when prices tend to rise and raise them when prices tend to fall. Keynes’s ideas took a dramatic change, however, as unemployment in Britain dragged on during the interwar period, reaching levels as high as 20 percent. Keynes investigated other causes of Britain’s economic woes, and The General Theory of Employment, Interest and Money was the result. Keynes’s General Theory revolutionized the way economists think about economics. It was pathbreaking in several ways, in particular because it introduced the notion of aggregate demand as the sum of consumption, investment, and government spending; and because it showed (or purported to show) that full employment could be maintained only with the help of government spending. Economists still argue about what Keynes thought caused high unemployment. Some think he attributed it to wages that take a long time to fall. But Keynes actually wanted wages not to fall, and in fact advocated in the General Theory that wages be kept stable. A general cut in wages, he argued, would decrease income, consumption, and aggregate demand. This would offset any benefits to output that the lower price of labor might have contributed. Why shouldn’t government, thought Keynes, fill the shoes of business by investing in public works and hiring the unemployed? The General Theory advocated deficit spending during economic downturns to maintain full employment. Keynes’s conclusion initially met with opposition. At the time, balanced budgets were standard practice with the government. But the idea soon took hold and the U.S. government put people back to work on public works projects. Of course, once policymakers had taken deficit spending to heart, they did not let it go. Contrary to some of his critics’ assertions, Keynes was a relatively strong advocate of free markets. It was Keynes, not adam smith, who said, “There is no objection to be raised against the classical analysis of the manner in which private self-interest will determine what in particular is produced, in what proportions the factors of production will be combined to produce it, and how the value of the final product will be distributed between them.”1 Keynes believed that once full employment had been achieved by fiscal policy measures, the market mechanism could then operate freely. “Thus,” continued Keynes, “apart from the necessity of central controls to bring about an adjustment between the propensity to consume and the inducement to invest, there is no more reason to socialise economic life than there was before” (p. 379). Little of Keynes’s original work survives in modern economic theory. His ideas have been endlessly revised, expanded, and critiqued. Keynesian economics today, while having its roots in The General Theory, is chiefly the product of work by subsequent economists including john hicks, james tobin, paul samuelson, Alan Blinder, robert solow, William Nordhaus, Charles Schultze, walter heller, and arthur okun. The study of econometrics was created, in large part, to empirically explain Keynes’s macroeconomic models. Yet the fact that Keynes is the wellspring for so many outstanding economists is testament to the magnitude and influence of his ideas. 1913. Indian Currency and Finance. Reprinted in Keynes, Collected Writings. Vol. 1. 1919. The Economic Consequences of the Peace. Reprinted in Keynes, Collected Writings. Vol. 2. 1920. The Economic Consequences of the Peace. New York: Harcourt, Brace, and Howe. Available online at: http://www.econlib.org/library/YPDBooks/Keynes/kynsCP.html. 1923. A Tract on Monetary Reform. Reprinted in Keynes, Collected Writings. Vol. 4. 1925. The Economic Consequences of Mr. Churchill. Reprinted in Keynes, Collected Writings. Vol. 9. 1930. A Treatise on Money. Vol. 1: The Pure Theory of Money. Reprinted in Keynes, Collected Writings. Vol. 5. 1930. A Treatise on Money. Vol. 2: The Applied Theory of Money. Reprinted in Keynes, Collected Writings. Vol. 6. 1936. The General Theory of Employment, Interest and Money. Reprinted in Keynes, Collected Writings. Vol. 7. 1971–88. Collected Writings. London: Macmillan, for the Royal Economic Society.